What is Blade Battles? Its a third person multiplayer ninja based action game! It's aim is to provide the number one most important thing in games, FUN! Graphics come after that, with over 100 animations to allow smooth seamless player actions and movement. Where does the game take place? 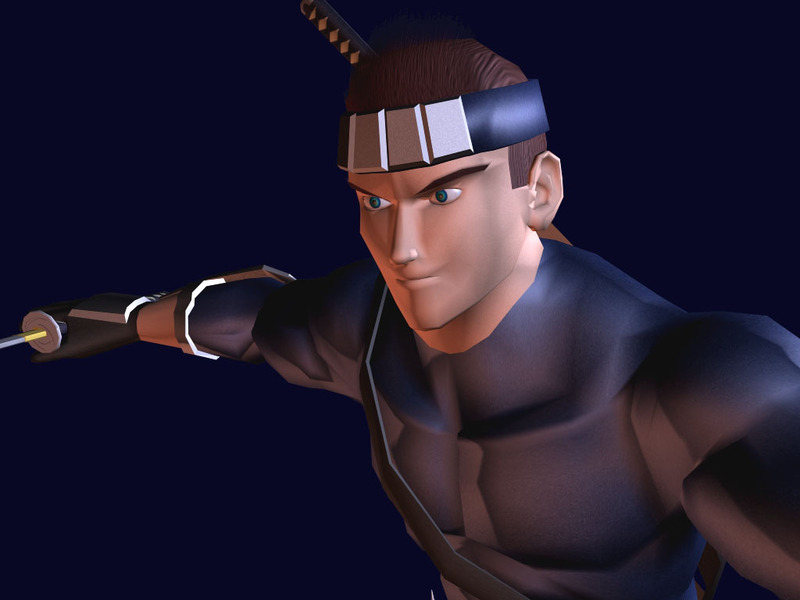 Blade Battles takes place in an alternate ninja universe, that mixes modern and traditional styles of ninja art. Environments consist of buildings, mountainous and forest areas, with varying times of the day and weather. What can you do? You can run, jump, crouch, roll, and swim as elegant and smoothly as a ninja, can attack with the same swiftness and quickness. How does movement work exactly? There are 4 direction keys, and each direction key makes the player character run/swim/jump and face in that direction. Can also combine movement keys to go in diagonal movement for a total of 8 directions. How about jumping? Jump is a normal jump type of movement, but if pressed again at the peak of a jump, executes a double jump. This command also makes a player character swim upwards when in water. When you jump to a ledge that is slighty higher then you to land your feet on, but low enough to grab onto with your hands, you automatically grab and climb the ledge. How useful is crouching? Crouch is used for defensive movement and when held down (avoids horizontel sword slashes if attack is on even ground with defender), and a direction key is pushed, executes a roll manuver. When swimming in water, it makes the player character dive. What weapons are there? There are 2 types of blade weapons and there are 2 types of throwing weapons in the game. You can even attack with hand to hand based combat, but the blades is where the name of the game comes in. The two types are Light and Heavy. Light blade and Heavy blade? Light blades are thin, light and fast blades, allowing good movement speed then Heavy Blades. Heavy blades, large, thick, heavy and slow blades, allowing very strong damage and allows you to break through almost any defense, but with slow speed, and movement. It all comes down to what style of blade you prefer, and your playing style to match it. Carrying no Blade grants the fastest movement speed. You can only use a Light Blade underwater. You can carry only one blade at a time. What about Projectile weapons? Can only carry one type of projectile at a time. Throwing Stars are faster then Knifes, but do less damage. Throwing Stars have better range then Knifes. Knifes can cancel out Throwing Stars when they collide in mid air. To switch between types of projectiles, first you must deplete all of your current projectiles. How do you change blade/projectile, or at least throw away your current one? There is a command that throws away your current weapon in your inventory to where your crosshairs are aimed at. You cannot throw away/pickup Grappling Hooks though. For Blades, they can be used to attack, or to throw away and pickup a different Blade. To pick up a Blade, stand over it and push the 'Throw Selected Weapon / Pick up Weapon' command key. You can swap a Light Blade for a Heavy Blade or vice-versa this way. Throwing a Light Blade can go faster and further then a Heavy Blade, while throwing a Heavy Blade does more damage and cannot be blocked. For Projectiles, the command throws ALL of your Throwing Stars or Knifes at once. When you have no Projectiles in your inventory, you can pickup a Projectile box, or a Projectile lying about in the environment with the 'Throw Selected Weapon / Pick up Weapon' command key. The Player Character will automatically pick up the same type of Projectiles (you have in your inventory) lying around the map, like Projectiles thrown in walls etc. to increase your current count of projectiles. Hand to Hand combat? This is your last resort when you have your weapon knocked out of your hands. When used on its own, with no bladed weapon in your inventory, you have the advantage of great movement speed and fast (but weak) attacks. The Grappling Hook? A grappling hook can be used to help reach high places, or to hide in the darkness of unlit ceilings, to come crashing down on an unsuspecting foe. It can also be used to grab weapons or projectiles and reel them in, if you can put them into your inventory. When used on another player character, they get stunned for a short moment and recive a small amount of damage. How does attacking work? The attack key/button executes the first attack in a selected combo, and when pressed again in correct timing, can continue the combo with more hits. This applies to all weapon types, except the grappling hook. Press once to launch the hook, and press again to reel the rope in. When the user hasn't input an attack command after a short amount of time, the character model automatically sheaths/puts away the weapon. When Attacking with Blades, the player character will lock onto the closest player within a certain range of area. Selected combos? You have the ablity to design your own combo's via a combo editor in the game. More on this will be explained at a later date. How does one defend himself against all these varities of attacks? With all all useful, Block key! Block key/button when held down on its own blocks most attacks, but if the block key/button is pushed at the same time as reciving an attack, allows the defender to Parry the attacker. Must crouch to block low attacks. Can't block Heavy Blade attacks with a Light Blade, or Melee. When you try to block a heavy attack, you get knocked back and get stunned for a short amount of time, as well as taking slight damage or havingthe weapon knocked out of your hands. Only way to Block and Parry Heavy Blades is with a Heavy Blade. A thrown Light Blade can be blocked, but a thrown Heavy blade cannot. When Blocking, the player character will lock onto the closest person withing a certain range of area. You use the mouse to look around? The mouse is used for rotating the camera around the player character, and for aiming projectile weapons. Turning the camera does not turn the character around to face in the camera's direction. This removes the first person feel when playing a third person game. It still plays and functions like one, in terms of control, but not in terms of looks and feel. So when the character goes to run left/righ/backward, it does not strafe but runs/faces in that direction.